Recess by Narciso Desmadryl from Perkins Bacon Plates 1854 (Jan-Feb): 5 c. deep reddish-brown, wmk. pos. 1, the superb used vertical strip of six with good to large margins all round - exceptional for such a multiple, of fine colour and neatly cancelled in black by five strikes of the target handstamp in black and small part of a red circular datestamp. Creased between third and fourth stamps in margin only, in no way affecting the appearance of an exquisite and extremely rare multiple. Cert. 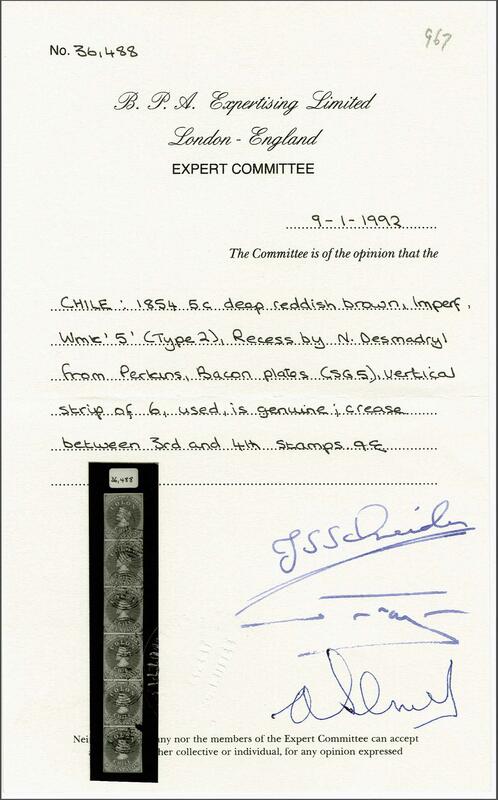 BPA (1992).rnProvenance: Collection Jean Dupont, Balasse, May 1981, lot 78; Collection Gerhard Blank, RL, Dec 1991, lot 967.